Uta is excited to join the 10K Müggelsee run this Sunday. The yearly event takes place at the Müggelsee in the eastern suburbs of Berlin. The beautiful lake, also known as the Großer Müggelsee, will host a 5K, 10K and half marathon on the same day. Uta looks forward to running with new and old friends on the scenic course. This year, late entries are still possible for the events. Come out and join Uta for a wonderful time at Berlin’s picturesque lake. Please note that this year’s start location has been changed. For more information please visit: Website of the Müggelsee-Event. 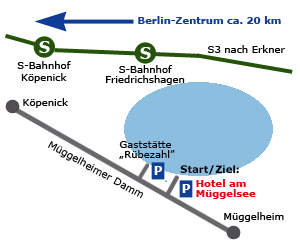 Start: 'Hotel am Müggelsee', Müggelheimer Damm 145, 12559 Berlin.